Former Northern Territory fishing guide, Rick Huckstepp, now works as a freelance photo journalist for the On the Road Magazine and is currently chasing adventures travelling around Australia trusting a KYMCO MXU 400 ATV for the roughest off-road travel to ensure his adventures come to life. Covering the Oonadatta Track, Kakadu and inland WA including the gold fields, Tanami Road, Flinders Range, Innamincka races, dinosaur fossil country in Queensland, the gold fields in Cape York and much more, Rick travels in a camper trailer with the MXU 400 ATV on board, using the Kymco's most powerful quad bike to date for the roughest off-road travel imaginable and extended trips into the remote bush. Below is the second log of Rick Huckstepp’s adventures with the Kymco MXU 400 ATV. 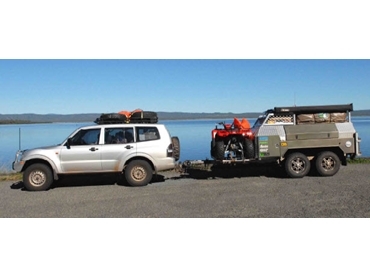 I must say it was disappointing to have to load the Kymco MXU 400 ATV onto the Huckfish bush trailer again and leave the remoteness of Central West Queensland; but there were many more places to go! The spinifex plains and washed out creeks were to be replaced with rural horse paddocks; for a little while at least. The MXU 400 ATV is most definitely a versatile quad bike. From mechanical mountain goat to bionic musterer; this Kymco is at home being both. With the farm run finished it was back to Brisbane to complete the shakedown on the trailer. That is, alter a few things, throw out half the gear we did not use and add what we initially went without. A service is looming on the quad bike after which early to mid-August will see it on the way to the Innamincka Races. Whilst not likely to get a starting gate there, it will at the Teetulpa Goldfields nearby when the metal detectors will grace the front rack once again. From there I will grab the chance of a life time and head to the Cooper Creek which has seen its best rains in probably 50 years. The place will have a new lease of flora and fauna, not to mention an influx of yellow belly and yabbies and hopefully some serious mud to make the MXU 400 feel at home.